The Timberland Boondocks are one of our most popular and comfortable lines of boots. Timberland reinforces the Boondocks with Ever-Guard™ leather and molded rubber toe protectors for abrasion-resistant performance. 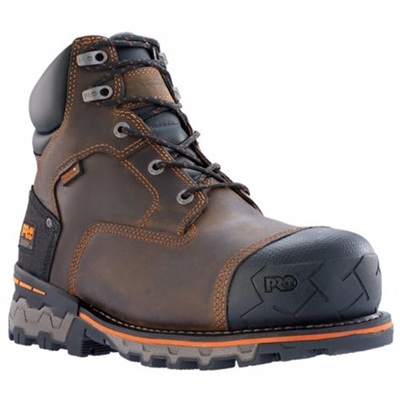 These waterproof boots also feature lightweight cushioning, including a dual-density midsole and rugged lug outsoles to conquer long days on any job site. Lightweight, non-metallic, asymmetrical-shaped composite toe cap. Meets I/75 and C/75 impact compression and ASTM F2412-11 and F2413-11 safety standards.